Many times throughout the year you will hear me say that our Shrine needs a facelift and our goal is to make the inside of The Shrine of Our Lady of Pompeii as beautiful as the day it was created in the beginning of the 20th century. I am proud to proclaim we are one giant step further in making that happen. When the parish formally closed in the beginning of the 1990’s, the property (owned by the Archdiocese) was to be sold. The Italian-American community marshaled their forces together and asked that this property be allowed to remain as a tribute to the Italian-Americans. In the past 20 plus years, we have done a lot of restorations to make the bones of the building safe and secure: We completed tuck pointing on the exterior, the bell tower was shored up and we even patched all the holes that were letting cold air in. Our major interior restoration goals remain new flooring, interior painting, lighting, a new sound system, putting in an elevator and re-doing the art work. Thanks to a very generous gift, we were able to complete one of the most important interior restoration projects honoring Blessed Bartolo Longo. Bartolo Longo was born in Pompei, Italy in 1841. During his studies to become a lawyer, Longo joined a sect and was ordained as a priest of Satan. Along the way a Dominican priest, who had a deep, personal devotion to Mary, changed Longo’s beliefs. Thus Longo became devoted to the church and Mary. Our community has received a gift for future generations: A fully restored Relic Altar dedicated to Blessed Bartolo Longo. Perhaps, prior to October of 2016, you saw scaffolding and work being done on the north-east side of the altar to beautify our Shrine… just like beautification work Longo spearheaded so many years ago in Pompei. This restoration was a gift that was fully funded by the Knights of the Holy Sepulchre. Longo was one of those Knights. On October 21, 2016 The Shrine of Our Lady of Pompeii was honored to conduct a Dedication Mass of the Relic Altar of Blessed Bartolo Longo The Presider for the dedication was Most Reverend Alberto Rojas, Auxiliary Bishop of Chicago. The Equestrian Order of the Holy Sepulchre of Jerusalem, as well as members of The Shrine of Our Lady of Pompeii, Chicago were in attendance at the Dedication Mass. 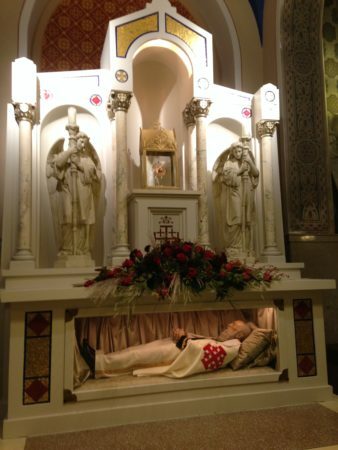 With deep gratitude, we dedicate today the Relic Altar of Blessed Bartolo Longo. Deus lo vult – God wills it! May Blessed Bartolo Longo be honored here. May he guide and direct, with God’s grace, the work of the Knights and Dames, who continue to do what God wills for the flourishing of the Reign of God in Jerusalem, in Pompei, Italy and in the United States of America. God, Father of mercy, we praise you for having sent into the history of mankind, the Blessed Bartolo Longo, ardent apostle of the Rosary and shining example of a layman deeply involved in the evangelical witnessing of faith and of charity. We thank you for his extraordinary spiritual journey, his prophetic intuitions, his tireless endeavors on behalf of the poorest and the neglected, the devotion with which he served your Church and built the new city of love at Pompeii. We beseech you, grant that Blessed Bartolo Longo soon be numbered among the Saints of the universal Church, so that everyone may follow him as a model of life and benefit by his intercession. Amen. O blessed rosary of Mary, sweet chain which unites us to God, bond of love which unites us to the angels, tower of salvation against the assaults of hell, safe port in our universal shipwreck, we will never abandon you. You will be our comfort in the hour of death; yours our final kiss as life ebbs away. And the last word from our lips will be your sweet name, O Queen of the Rosary of Pompeii, O dearest Mother, O Refuge of Sinners, O Sovereign Consoler of the Afflicted. May you be everywhere blessed, today and always, on earth and in heaven. Amen! Francis Cardinal George O.M.I, Archbishop of Chicago and Fr. 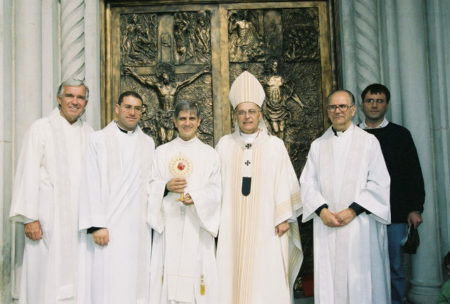 Richard Fragomeni, Rector, The Shrine of Our Lady of Pompeii, Chicago receiving relics of Blessed Bartolo Longo at The Shrine, in 2004. 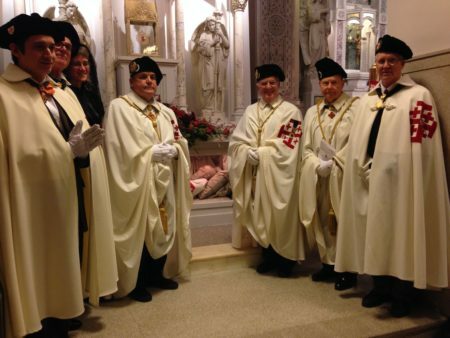 Knights of the Holy Sepulchre at the Relic Altar Dedication Mass Program on October 21, 2016.